The next time you go where no one has gone before, you should take this softbound Star Trek: The Next Generation Enterprise Journal with you. With a debossed U.S.S. Enterprise-themed cover and 200 red foil-gilded lined interior pages featuring the delta imprint, it measures about 8 1/2-inches tall x 5 1/2-inches wide. 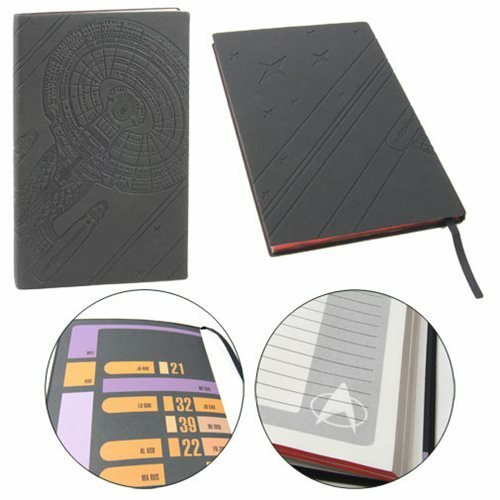 The front and back inside covers boast full-color LCARS (Library Computer Access/Retrieval System) graphics, and there's even a ribbon bookmark! Ages 13 and up.